In the News Recent News Are there sharks in the Chesapeake Bay? Are there sharks in the Chesapeake Bay? There are at least 12 species of sharks found in the Bay. Some are quite abundant, while others are very rare. As the heat of summer continues, people in the Chesapeake Bay region are spending more and more time on and in the water, which often leads to one of the biggest questions and concerns about safety in the Bay: Are there sharks in the Bay? The answer to the question is yes, there are. In fact, there are at least 12 species of sharks found in the Bay. Some are quite abundant, while others are very rare. Whether you need to be concerned about shark attacks while swimming or boating is another story though. The sharks that are found in the Bay rarely pose a threat to human safety, but as with any wild creature, you’ll want to be cautious. Sharks may be cool to look at, but the best option for their safety and yours is to leave them alone. As of 2015, the Maryland Department of Natural Resources had not recorded any shark attacks in the Chesapeake Bay or in any of Maryland’s waters. The International Shark Attack File records no unprovoked shark attacks in the state of Maryland and only five in the state of Virginia, none of which occurred in the Chesapeake. There are five species of sharks that are common to abundant in the Chesapeake Bay. 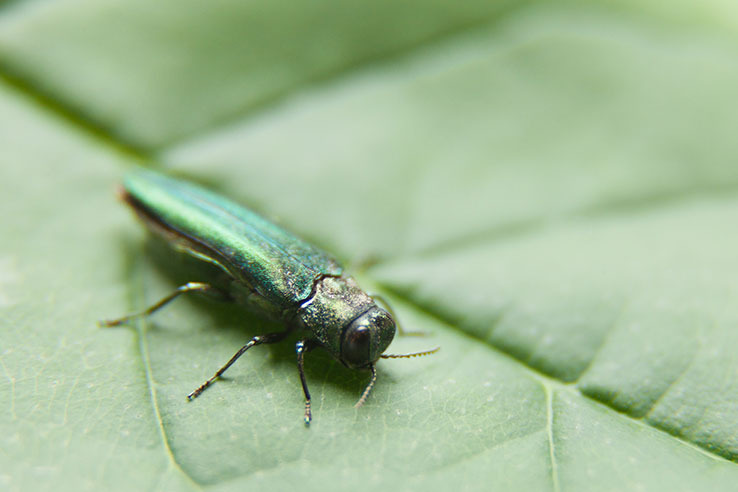 Be on the lookout for these species during the summer and fall, and make yourself aware of the risks associated with each of them. Some are considered more dangerous than others, but most will not cause any problems as long as you do not provoke them. The most common shark found in the Chesapeake is the sandbar shark (Carcharhinus plumbeus). The sandbar shark can be found in the Atlantic Ocean from Massachusetts all the way to southern Brazil, and is a seasonal visitor to the Chesapeake Bay in the summer and fall. Juvenile sandbar sharks are common to abundant in the Bay during this time of year. 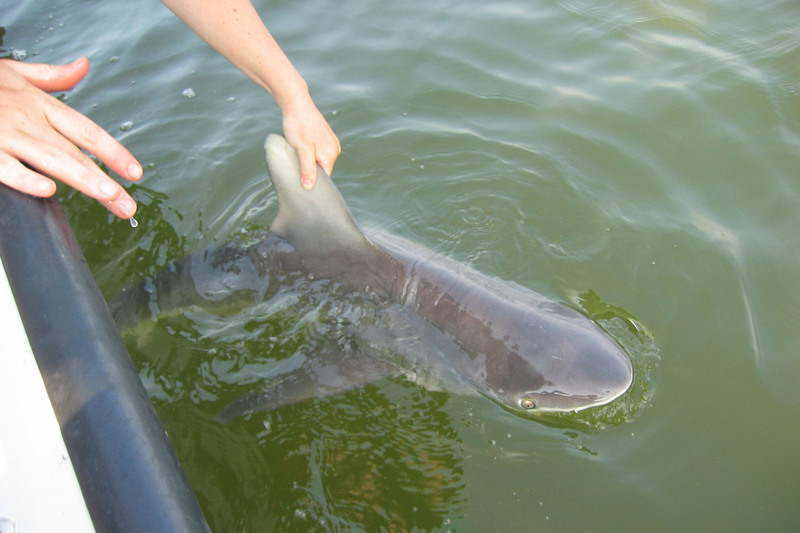 In fact, the Bay is one of the most important nursery areas on the East Coast for young sandbar sharks. But don’t worry about a sandbar shark attack – it typically preys on bottom fishes, other sharks, rays and invertebrates. The Bay’s blue crabs are a particular favorite of the sandbar shark. The bull shark (Carcharhinus leucas) is a close cousin of the sandbar shark, but is more aggressive. The bull shark is an occasional summer visitor to the Chesapeake Bay, reaching as far north as the Patuxent River. It feeds on bony fishes, rays and other sharks (particularly juvenile sandbar sharks), in addition to crustaceans, turtles and mammals. Many shark attacks have been attributed to bull sharks, since their behavioral habits bring them in close proximity to humans. While bull sharks are considered to be one of the three most dangerous shark species, they are not a significant threat to human safety in the Chesapeake Bay. The sand tiger shark (Odontapis taurus) is a common visitor to the lower Bay during the summer and fall. It is most often found along the Bay’s bottom and is active at night. It feeds mostly on small fishes, squids and other sharks. It is the primary predator of sandbar sharks near the Bay’s mouth. The sand tiger looks dangerous because of its size (up to 10 feet long) and jagged teeth, but there have been no recorded attacks on humans. However, as with any shark, it is recommended that humans do not provoke sand tiger sharks. The smooth dogfish (Mustelus canis) is a common to abundant visitor to the Chesapeake Bay in the summer and fall. 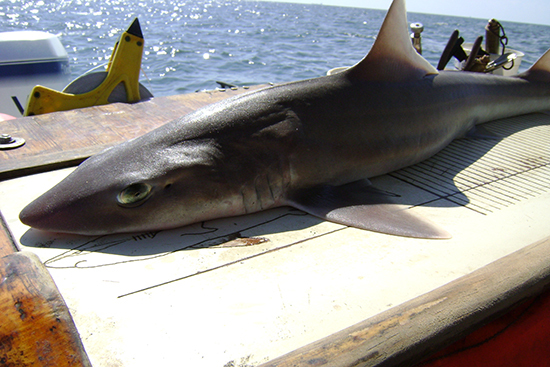 The smooth dogfish is only found in coastal areas of the western Atlantic, from Massachusetts to Venezuela and then from southern Brazil to Argentina. It is especially common in the lower Bay, as far north as the Patuxent River, in waters less than 60 feet deep. 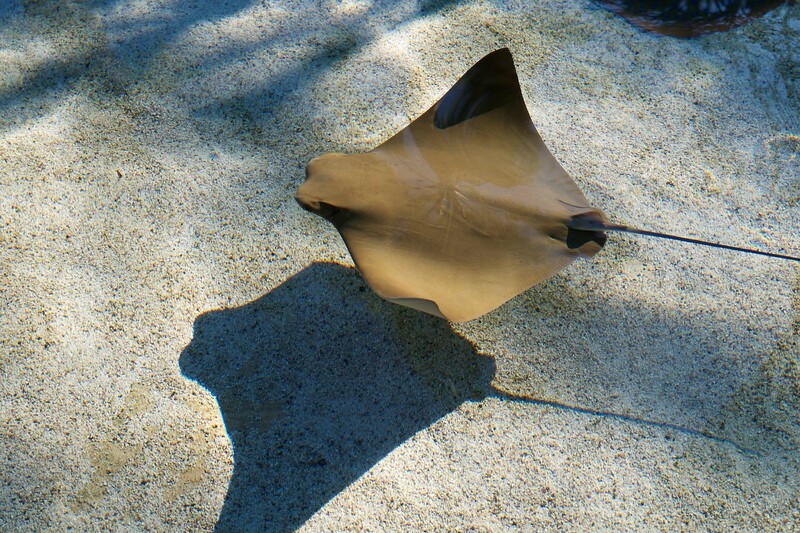 It is an active swimmer and feeds on large crustaceans and crabs at the Bay’s bottom. Smooth dogfish usually travel in schools or packs. The spiny dogfish (Squalus acanthias) is commonly found in the lower Bay south of the Potomac River in late fall through early spring. Like the smooth dogfish, it often travels in schools, but it is a much slower swimmer and inhabits deeper waters. The spiny dogfish is found in temperate coastal waters of all seas and oceans in the world. There are four more species of sharks that are occasional to rare visitors to the Chesapeake Bay. The more frequent of these are the basking shark and the bonnethead. The basking shark (Cetorhinus maximus) is an early spring visitor to the Chesapeake Bay. The basking shark, often observed swimming and feeding at the water’s surface, occasionally ventures from its normal coastal habitat into large bays like the Chesapeake. Most of these sightings are reported as being of one to three individuals, although there have been reports of hundreds of them at once. The bonnethead (Sphyrna tiburo) is an occasional summer visitor to the lower Chesapeake Bay. 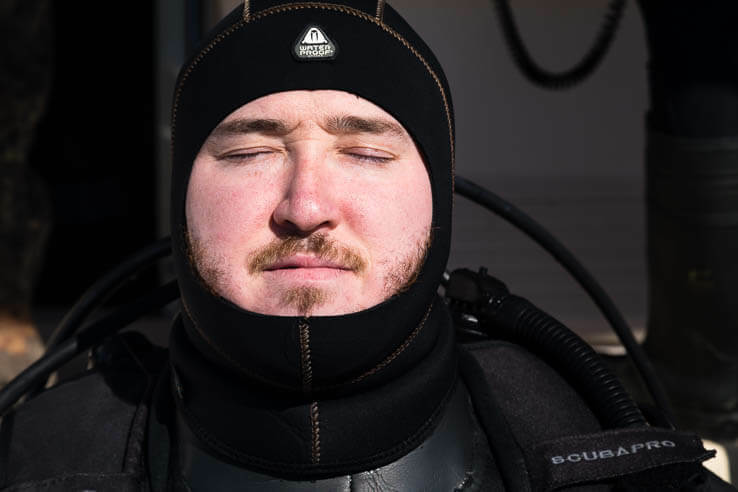 It mostly inhabits waters that are between 30-80 feet deep. Bonnetheads are more common in southern waters and often seen in groups of dozens, but are less common in the Chesapeake. More rarely found in the Bay are the smooth hammerhead and the Atlantic angel shark. The smooth hammerhead (Sphyrna zygaena) is a rare to occasional summer or fall visitor, found as far north as the mouth of the Choptank River. The Atlantic angel shark (Squatina dumeril) is another summer and fall visitor in the lower Bay that is very rarely found farther north in the Bay. Even less frequently observed in the Bay are the scalloped hammerhead, the Atlantic sharpnose shark and the dusky shark. The scalloped hammerhead (Sphyrna lewini) rarely enters the Bay at all, but there have been a few records of it at the mouth. The Atlantic sharpnose (Rhizopriondon terraenovae) is a rare visitor to the lower Bay only. And the dusky shark (Carcharhinus obscrurus) used to be fairly common in the Chesapeake, but is now just an infrequent visitor to the lower Bay in the summer months. There are several other shark that have been seen in the Bay before, but may not ever be found here again. For the most part, these sharks have a single record on file as being spotted in the Chesapeake. The nurse shark (Ginglymostoma cirratum) was seen in the lower Chesapeake in 1877 and has not been spotted since. It is more common in tropical and subtropical waters as well as along the eastern Pacific and West African coasts. 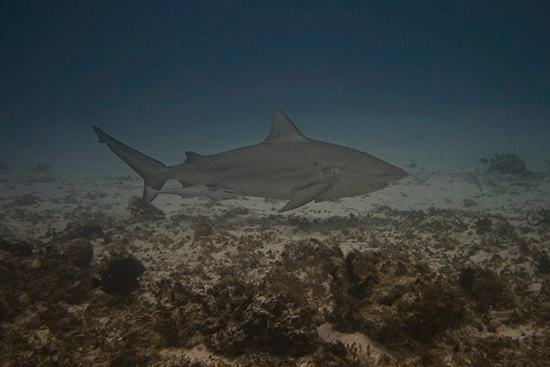 The lemon shark (Negaprion brevirostris) and the blacktip shark (Carcharhinus limbatus) are common along the Eastern Shore in coastal lagoons and along Atlantic beaches. The lemon shark was found once near Fisherman Island in 1981, and the blacktip was collected there in 1980. The tiger shark (Galeocerdo cuvier) is a rare visitor to the lower Bay, with a single record of it at Smith Island shoal at the mouth of the Bay. Overall, sharks aren’t a major safety concern in the Chesapeake Bay. The lower Bay’s role as a nursery area for sandbar sharks makes it the most abundant large shark population on the Atlantic coast. But populations of other shark species are limited in this area, so unprovoked attacks are incredibly rare. Still, next time you’re out on the Bay, be on the lookout for some of these shark species for a little bit of a science lesson. Although they aren’t as abundant or as culturally or economically valuable as many of the Bay’s other species, they are still an important part of the Bay’s ecosystem. While swimming off the end of my family’s pier in 1969, with a mask and snorkel, I saw a large bull shark. I quickly climbed up the ladder of the pier to safety! Our home was on the Chester River, a few miles upriver from Chestertown, MD. Even then, it was well-known to the locals that there are bull sharks in the Chester River! The natural habitat of the great white shark is not typically the Chesapeake Bay, but they have been known to enter the mouth of the Bay near Virginia Beach. Check out this article from last summer when two were spotted just days apart: https://www.chesapeakebaymagazine.com/baybulletin/2018/6/17/seeing-double-back-to-back-great-white-shark-encounters-off-virginia-beach. Saw a swimming Lemon Shark near the coast. The shark soon vanished, and when I went to the place where it was, I saw a lot of broken shark teeth and bones. The shark was dead with a large bite in it’s back, the size of a Great White Shark bite. Unsolved Mystery: Do Great Whites live in the Chesapeake? Caught a very small hammerhead - maybe 18 inches long - off Saxis in 76. Threw it back…. but it was a hammerhead. Beach, Calvert County, Maryland, USA. laceration of the right leg below the knee. Hospital by his mother, Mrs. Dorothy Stanton. reproduced in any form without written permission of the Global Shark Accident File. Ken. Gez how big was their crab pot. You mean outside tangled not it made its way into the pot like ells and smaller fish.. I Grew up on the eastern shore VA. And have caught a ton of sharks in the Chesapeake bay. Largest I ever caught in the bay was a 7ft bull shark. Caz l. Salvador….I would not be surprised if there are bull sharks where you are swimming. They swim up river to have their young and they like shallow water. 10 feet is plenty deep for them! Be cautious and keep an eye out when swimming. I swim 2 miles up the Occohannock creek (the eastern side of the Chesapeake). I hope to heavens no bull sharks would ever be there (max depth maybe 10 feet). Any reassurance appreciated. Spotted: three dolphins at Tanyard Landing on the Poropotank River - August 2016. Though I haven’t done so in many years, I used to swim, ski, paddle, on this small river all the time. Recently, my paddling has been limited to the Mattaponi River, but I’ll think twice about venturing out into deep water with my little kayak. I was fishing in the bay about five years ago just cruising the shipping channel. We noticed the water voiling with taylor blurs so we dropped some big cuts of cut bate. It turned out to be a school of black tip sharks. I have heard of people catching them a lot so i dont know why they are listed as rare. There has been a bull shark frequenting the waters off of Cabin Point, VA this summer (2017). Bull shark..2..spotted between Davis pub and mcnasby last night. Startled me in the kayak. omg I always go in the bay, swimming,tubing,kayaking,I do everything, and one day last week I got on the tube but I had a really bad feeling, that I shouldn’t tube bc there was a shark, but I thought there wasn’t any sharks but I still didn’t tube, but now that I read this, now I’m thinking that there actually was a shark. Strange how they haven’t mentioned Great Whites when they have been spotted in the bay. Rare, but they have been. My family and I spent last weekend on a creek in Heathsville, VA. After 4 days playing in the water, we saw two sharks in the water (believe they were tiger sharks). Very frightening. They were only about three feet past the end of a 40’ pier. My 8 & 11 year old spent a lot of time in that water paddle boarding and kayaking. Too close for comfort ! I was surprised because the Potomac River is not known for sharks but this spot was right where the Chesapeske meets the Potomac. I believe it was Hull Creek. I THINKS its cool what your doing.Im going to be an shark hunter.from MICHAEL P.S YOUR COOL ALL OF YOU!!!!! My husband and I were sitting on our pier at Waterview in Nanticoke, Maryland on Saturday (7/19/2014) evening to watch the sunset. We saw a dorsal finned fish come to the surface a couple of feet from our pier. The fin appeared to be about 6”- 8” tall above the water. The fish then disappeared under water. Only moments later we spotted two of them side by side on the side of the pier. We have never seen or heard of any spottings of sharks in that area. Our location is close to the mouth of the bay. Very interesting! People should stay out of the water when there has been a shark sighting. The ocean belongs to the sharks; we should not be swimming in their ocean if we want to be safe. Just a thought. I was fishing on the Cape this summer and I saw what had to be a ten foot 300+ pound shark, probably a big sand tiger or bull, rise and show its dorsal fin and back. The exposed part of the back alone was around 4 feet long. And I know it wasn’t a dolphin because of the shape of the dorsal and color of the skin. Sharks are making a comeback, as seine and long lined commercial fishing is more closely regulated. I,too, have seen all of these species, especially within ten miles of the beach. To my knowledge, there is no longer a Va.Beach Sharkers Club, but if someone could find records of THAT group from the 60’s and 70’s, you would be amazed at the local catches. I grew up in Poquoson, Va.from 1976-1984 and had the honor of seeing most of the listed species of sharks in your article. My grandfather Crosby C. Forrest had a restaurant at the end of Messick Rd. Not only was he a restaurant owner, he was also a true blooded waterman thru and thru. He is gone (R.I.P. Cros) and so is his restaurant, but some of the best times of my life were spent out on the water with him in the James River/Chesapeake. Bay fishing, drinking, and observing the various wonders the ocean has to offer. I will tell you though, we had seen sandtigers 12-14 feet long no further than 12 miles from shore. Let me tell you, it’s quite the feeling to see a tigershark 14 ft.long when you’re along side it in a 20 ft.boat!